Jerwood Drawing Prize has established a reputation for its commitment to championing excellence, and for promoting and celebrating the breadth of contemporary drawing practice within the UK. 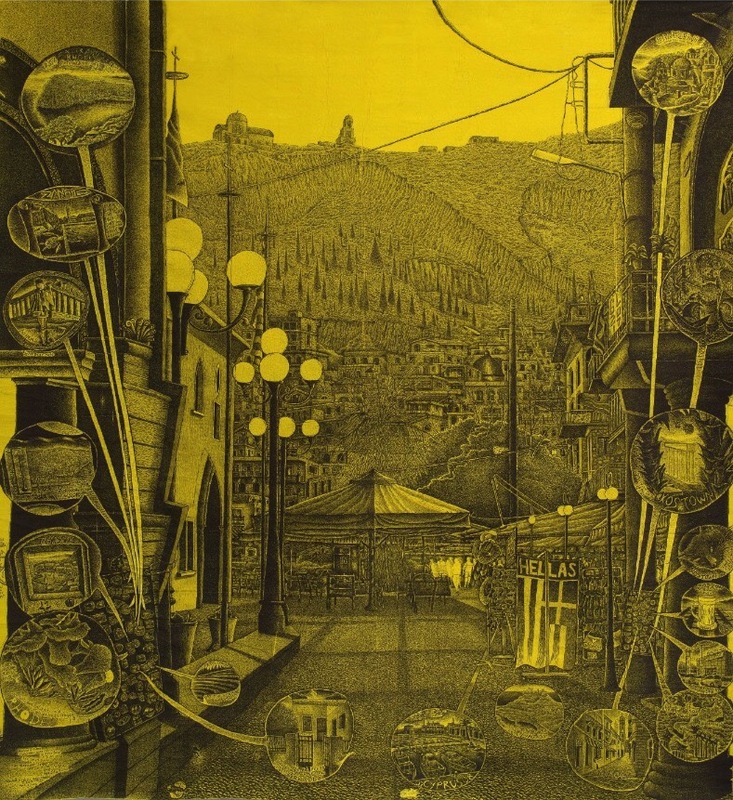 The prestigious First Prize of £8,000 has been awarded to Gary Lawrence for his monumental drawing Yellow Kalymnos and Fridge Magnets; this is first time an artist has won twice in the history of the award. Gary Lawrence’s intricate depiction of Greek Island Kalymnos, which has been produced in felt pen and poster paint, is a celebration of draughtsmanship and observational skill. The complex composition provides a snap shot of popular tourist spot Kalymnos Square, honing in on the myriad of magnets for sale at the side of the road, each accompanied by an ironic comment from the artist – ‘Athens – never been here’, ‘Cyprus ‘08 ok-ish’, ‘Zante Town – Euro Spar’. Taking almost a year to complete, the drawing is a labyrinth of personal narratives, executed with technical precision using readily available craft materials. Professor Anita Taylor, founding Director of the Jerwood Drawing Prize recalled the moment the drawing was unfurled for the selection panel to view: “it was immediately striking, with its intense colour and construction – it was compelling.” Artist and selector Michael Simpson said Gary Lawrence’s drawing was “a brilliant evocation of a time capsule; of time squashed in on itself as a topographical romance in retrospect.” Dr David Dibosa, also on the 2017 panel, felt the piece “radiated power”.